- She said her husband detests oppression and has always stood in defence of the oppressed. 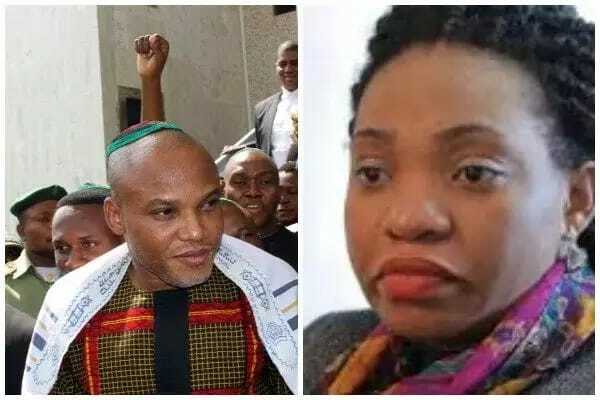 The wife of the leader of the Indigenous People of Biafra (IPOB) Nnamdi Kanu has said that her husband is obsessed with the agitation for the freedom of Biafra. Uchechi Okwu Kanu in an interview with Thisday said her husband detests oppression and has always stood in defence of the oppressed. she said: "He is a man that is obsessed with Biafra to the point of insanity and many times he has said publicly that he would gladly sacrifice me, the children and the wider family, if that is what it would take for Biafra to be free. That is the type of man Nigeria is facing, and that is the kind of man my husband is." Calling for the unconditional release of her husband and other members of the IPOB detained by the Nigerian government, Uchechi said the federal government has no case against the detainees. She she all the IPOB members detained, including her husband her political prisoners. Uchechi said: "Nigeria is presently situated in the right context of the word “democratic ignorance”, which prompts me once again to call the government of Major-General Buhari a democratic dictatorship, not a government of the people, by the people and for the people." "We Biafrans have the uncontested right to self-determination; the Nigerian government and their terrorized judiciary, who are afraid of honest interpretation of the law, should stop interfering in this case because all they end up doing is foolishly showcasing their unintelligent criminal cheating minds before the whole civilized world," Uchechi said. "As for the struggle, the Nigeria government and her agents should allow us Biafrans to hold a referendum (with reference to Scotland/UK). If we lose, we will stop agitating for Biafra," she said. "Let me tell you, Biafra is my hope. I see Biafra as a new beginning, a place where systems are well structured, where there is civility, law and order because as it is, all I see is barbarism in Nigeria. My husband is right for insisting on freedom for all of us Biafrans and beyond because without it, life is meaningless. "My family is in England today, a very beautiful country, because the likes of Oliver Cromwell fought and many died that the House of Commons may be established to speak for the common man. Without justice, equity and fairness, Africa will remain backward.